Everyone is talking about heat pumps. If you ask a pool specialist to recommend the most efficient water heater for your pool, the first response will be to consider a heat pump installation. This method of water heating is relatively new, then why it became so popular? Let's see the components. Heat pump for swimming pools does not require a gas line to operate or lots of money to spend. The unit uses electricity to run while moving the heat from air, water or ground, rather than producing the heat. As a result, power consumption is very low. However, heat pump construction is not so simple as the electric type – blower, condenser, compressor, heat exchanger (evaporator coil) are usually inside, making the heat pump expensive to buy. Although the prices of the heat pumps are falling, don't expect to buy a good one for less than a $2000. Heat pumps for pools have an important restriction – they work efficiently only when the ambient air temperature remains above 45-50 degrees F, and they are perfect for warmer regions. If you live in the area with the colder climate you might want to consider a combination with the gas pool heater. Let’s take a look at the market, where several manufacturers have taken top positions. AquaCal SuperQuiet HeatWave line has three models on the market, ranging in power from 100K to 125K BTU and in prices from $3800 to $4800. The manufacturer claims that COP (coefficient of performance) is on the highest level. Titanium heat exchanger, patented counter-flow water management, corrosion-proof cabinet... are advantages. Rheem heat pumps come in Classic, Specialty and Compact lines, with nine models in total, and power from 95K to 133K BTUs. You have to dig into the details to discover all the differences, but be assured that all Rheem pool heaters are the high-quality ones. Jandy Pro Series heat pumps for pools have 72K – 137K BTUs per hour output and superior hydraulic flow. Each of eight models is equipped with registered control system Aqualink, which provides automatic temperature maintenance if you wish. 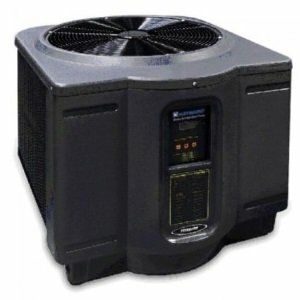 It is easy to grab leading manufacturers’ catalogs and find excellent specifications of heat pumps. The question is – how to choose the best one for your needs. Here are some tips for selecting the right model. First, set the size. An approximate calculation follows the formula: pool surface area in square feet x temperature rise x 12. The result is the amount of the heat pump BTU output required. (Temperature rise is desired swimming pool temperature minus the average temperature for the coldest month of pool use.) If your pool has no standard shape, depth, or has been positioned in the zone of very cold nights, strong winds, extremely low humidity... ask a pool professional to help in the calculation. The most popular heat pump sizes are from 75,000 BTU to 125,000 BTU. For some units, you will find a heat/cool option – heat pump can also cool pool water if you need it, but this kind of system is more expensive to buy. While selecting a model, review some important features such as the efficiency and component quality. COP (coefficient of performance) indicates energy efficiency with numbers from 3.0 to 7.0. Yet, be careful when comparing models from different manufacturers because the measurements must be done in the same conditions. The best heat pumps for pools are those with the highest energy efficiency, so make sure to buy the unit with the scroll compressor instead reciprocal compressor, which is found on the budget-friendly models. Sturdy and quality construction is also very important to protect the unit from the harsh conditions. After all, if you want to heat water in your pool frequently in not so cold climate, and have money for initial investment, buy a heat pump. With low electricity bills, it will be paid off quickly. And with the proper maintenance, it can last longer than gas type.